Alliance Disaster Kleenup (ADK), a member company of DKI, North America’s largest disaster restoration contracting organization, today announced their recent honor as one of 2016’s “Best Places to Work in Illinois” in the category of companies under 99 employees. 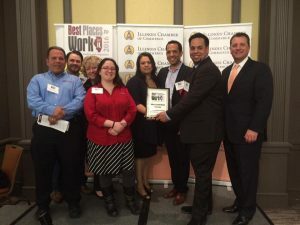 The “Best Places to Work” program is a survey, study and awards ceremony, established to identify and recognize the top employers in Illinois. Out of 400 nominated companies, only 25 with under 99 employees were honored at the 11thannual awards ceremony. The finalists were chosen based on an extremely detailed assessment of their business policies, employee engagement and work environment. ADK has been operating as a leading disaster response and restoration company in the Midwest for almost 15 years. ADK is unique in its compassion for its clients before, during and after a catastrophic event. This “client-centric” commitment is supported by maintaining a strong, team based environment. Headquartered in suburban Chicago, ADK is one of the most highly regarded disaster restoration organizations in North America. The services that ADK provides to insurance, commercial and residential clients include: emergency response, water damage mitigation, fire and contents cleaning, mold remediation, complete reconstruction, pre-incident planning and much more – 24 hours a day, 365 days a year. ADK returns damaged property to its pre-loss condition quickly and efficiently, delivering complete satisfaction to our consumer, insurance, and corporate customers. To learn more, please visit www.alliancedki.com.